Let me be the first to wish you Happy October! That's important, you know! If anyone else wishes you Happy October, I'd appreciate you telling them that I said it first, OK? That's important to me! After my series of small disasters at the house, yesterday, I sat down to the computer, and was met with a complaint about a member, and then a billing problem, and then a page that was not linked correctly. I was hurrying around, took a quick shower, and was waiting for a teleconference meeting at 9:30. They called at 9:25 and cancelled! Argh! I had cancelled a fishing trip, and another business meeting to stay home for this! What to do? Why, get up, and get out! Run for the river, of course! I took a very leisurely canoe trip down into tidewater to revisit the magic that surrounds me there. I saw no evidence of salmon, whatsoever, but it was fun to play the tidal game. I find it enjoyable to have fishing not the entire point of a trip. Down the river with the outgoing, and upriver with the incoming. No point to it, except to be there. There is something about a canoe that makes me feel like I belong there, more than in a boat with a motor. Cutthroat Trout aren't as afraid of me, as I slide past them. They swim up right beside me, as if to say, "Oh! Shoot! I didn't know you were here!" Kilchis is so proud of Mom! Nice 23 pound buck from the Nehalem. Caught on a whole herring at the tip of the island. Then dart away and hide with incredible success. When the water is low, you'd think you'd see them, but their camouflage is amazing! The river changes faces with the tidal exchange. On my way down on the outgoing, the river exposes the entire structure, and reveals all of it's secrets. Without it's aquatic clothes, the logs and the twisted old trees that have been there for decades, are exposed. It is incredibly clear and salt less water, that races down from the mountains. Gravel beds surround me, and leave me in a small channel of water that barely allows my travel. As I reach the very lowest tidewater, huge old growth trees, barely hanging on the muddy exposed banks, threaten to tumble into the river, and block my progress. Many have, and the need to negotiate them in a long canoe can be tricky! On the way back, I was able to cross over a log that previously forced me out of the river to drag the canoe around it, in a muddy marsh field. With the tide in, I neatly floated right over it! A higher than normal tide was predicted, and the flow of the river turned from meek, to strong, and surging. The water turned murky with salt, the water level rose and the structure disappeared. The river was now fully dressed, and ushered me quickly to my doorstep. It's almost like cheating, using the tides to push you in, and then out. All that is needed is a few dips of the paddle to steer your way, either way. I attempted to stop and fish in a couple areas, but the strong flow of the river kept pushing me... "Go, go, go... just please go!" I had no choice. It pushed me home. Just as easily as it had invited me in, it hurried me to leave. When I arrived home, I sat down at the computer, and was met with an incredibly easy afternoon. Was it the refreshment that the river had graced me with, or just an easy day to deal with? I'll never know for sure, but I honestly believe that somehow, my experiences on the river wipes clean any built up frustrations, and lets me start with a fresh outlook on life. The kids arrived home from school, and were pleasant, and extremely enjoyable. Interested in Walleye? You simply must read Stan Fagerstrom's column this week! Click here for his latest! Grant McOmie let me know that he is doing another segment on snagging tonight. Please stay tuned to channel two for the 5 PM newscast! We need help! If you haven't heard about our Anti Snagging Shirts, please click here. It's fun to watch these things get put together by the community. If you'd like to order one, please click here! How do we need help? Well, I sent in 100.00 to pay for the shirts to be made. We need more responsible parties to do the same. E mail Greenbuttskunk, or call him at 503-888-7513 and let him know you would like to help back the project. We would like to get this off and running soon, so if you are going to help, contact him asap! He's done an awesome job of putting this together. I've been there. It isn't easy! Much thanks to Brad! I've been mostly working on the net lately. No fishing for this girl. Tomorrow, a trip to the doc with Andrew, and a shopping stop at Costco. I hate to shop, so it's nice to come home with enough of everything to last me for some time and at a price you can't beat! I'm a Costco addict! Off I go. I'll be working at home today if you want to contact me, just fill out this form, and I'll get right back atcha! Bill and I have this new thing we do, that seems to bring on fish. I don't understand it, it doesn't make sense, but... it works! It happened one day by accident. 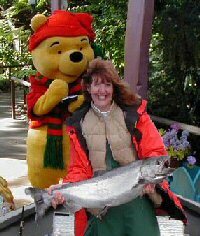 Bill mumbled, as we dragged spinners, "But Jennie, what would we DO with another salmon?" FISH ON! I'm not kidding! It's happened more than once! So, with that, and with the problem of too many salmon, too little freezer space, and too few empty slots on our tags, we bought a tool from Cabelas. It's new, and it's called a Hook Extractor. It really works well! We all know how those silvers like to twist and turn when hooked, and bringing them in can be tricky. If they are natives, releasing them without the use of a net is even trickier! No one wants to get their hands twisted up in that! Bill can tell you just how it feels to have a triple hook barb embedded in your hand, with a twisting, turning salmon sharing the other barb. Bill can tell you what it's like, and so can the local hospital! The new Hook Extractor works well. It comes with a lanyard, is tough and durable, and unlike others in the past, is built to last. On the Nehalem, I hooked a nice 23 pound buck. It was so beautiful and bright that I wanted to keep it. I tagged it, and sighed at the few blank spaces left on my tag. Then it was Bill's turn. We had laughed and joked about turning loose beautiful, bright salmon amongst a crowd of envious fishers. Well, he did it. He hooked a beautiful big salmon next to a group of fishers, and... well, out came the Hook Out, and out came the hook! "It works well!" Bill exclaimed, as he held up our new tool! People just stared, incredulously, as if we were both nuts! I have to admit, I thought he was, too! We released an absolutely beautiful, shining, sea lice covered fresh Nehalem salmon! "It was a hen." Bill explained. "Many more salmon will now have a chance at life!" "Oh!" I tried, failingly to match his enthusiasm. I have to admit, it was kind of fun! I think I'll try the Hook Extractor next! However, in the class ads on ifish, I found a freezer for sale. I think we bought it. Bill is going to go look at it, tomorrow. I may try the Hook Extractor on the next salmon I catch, but then again, I may not. After all, I have to give the new freezer a run for it's money. Then, as I vac pack the beautiful filets, I hope that I too, can cry out, "It works well!" We have the lucky winner of the Chris Vertopoulos trip! Just click here to see! It's fun to pick these. I just scroll up and down until Bill or Andrew says to stop. Then, there are about 10 entries on the screen, and I move my mouse up and down until they tell me to stop. Whoever it lands on, wins! This time it is... well... just click to see! More fun! I'm off to fish today! I usually dislike fishing weekends, due to the crowds, but Bill has to prefish for a guided trip tomorrow. I said I'd join in. You know, it's work, after all, and I'm all for helping people out when they have work to do! The rain is coming! You know that, right? I sat beside the small and ever diminishing pool of water at the head of the property last night, watching the small trickles of water bubble over the rocks. It's trying to fill the pool, but lacks in any kind of momentum or volume. That's going to change, soon! I remember last year, sitting beside it, as the water rose. I witnessed several salmon making their journey upstream to spawn, less than a foot from me. I can't wait to do this again! I recall setting my rod down, and just watching. It's fascinating! More so than hooking one and fighting it! I told Kilchis last night that the rains were coming. That means more time on the river. He's feeling a little ripped off, lately. There's not much that keeps me down at the river for longer than a half hour, when the water is so low. When the rains come, however, we'll be down there until he sits beside me, shivering from the cold, begging to go in! The cold fall wind will slam us sideways, the rain will beat down on our backs, and the salmon will pass in front of us, dodging our offerings. I can't wait! Frozen fingers, here we come! I have an odd fantasy. Don't worry. This is a family site. It's a family oriented fantasy, although it does have to do with the circle of life and pro generation. 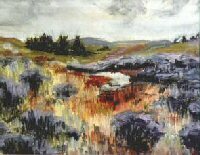 I am taken to my fantasy as I stand in the Kilchis river, at dusk. I feel bits of gravel and rock that I have dislodged from the river bottom. They lightly touch my boots on their way downstream. I glance down, in hopes that it was a cutthroat trout brushing up against me. Gravel and sticks, flotsam and jetsam are all that is there. As I stand there, repeatedly casting my fly for cutts, my mind wanders to this fantasy, over and over. I believe the idea came from a book I read, once. Reading along, I was taken to the place described, myself. I think I read that same page, over and over, not realizing I was lost in my own fantasy. I believe it to be a book called "Mountain in the Clouds" but I'm not certain. My fantasy (at last revealed) is to stand in the middle of a shin deep riffle. My pants, rolled up to my knees. All around me, salmon are spawning. The moonlight is bright enough to see them, yet dim enough not to disturb their natural behavior. Their tails, brush up against my legs. I feel the water being pushed by their frenzied movement. Now, before you do this, yourself, realize my dilemma. You shouldn't walk on spawning redds! So, how can my fantasy ever come true? I really, really want to do this! The thought came to me strong and vivid, the night that I was working on the revival of my large cutthroat trout last month. In the pitch blackness of night, I used a flash light on the water to track his progress. The fish in the water by flashlight was simply amazing! I tried not to direct the light on him too much, but when I did, I was utterly speechless. It was the most beautiful thing I think I have witnessed. Perhaps it is so stunning, because of my otherwise poor vision, and the flashlight aided me in seeing things I'd not seen before. The way the fins work, the body, moving in the current. I was speechless! "Bill! Look at that fish! Have you ever seen a fish at night like this?" Last night, on the way up the river, I wished I had the energy to go get a spot light, and cruise the river for salmon. I wonder if that is against the law. Spotting wildlife? I'm going to find out. If it's not, I have a new moonlight hobby! Not to target them, just to watch, fleetingly. I know that I would get far more out of spotting one, than by fighting with hook and line. It's the connection I crave, of any kind. Any fleeting experience I have, up close and personal, with the magical creatures that reside in the river. As I stand in the front of the boat, while Bill and I quietly slip through tide water, I'm always on alert for passing fish, whether they be cutthroat, mud cat, crawdad, or the rare glimpse of a school of steelies or salmon. This is what makes lasting impressions over whatever I may have hooked and landed that day. These are the things my dreams and fantasies are made of. I'll never be able to thank Chris Sessions adequately, in all of my life. Why? Not only because of the great guide he is, or the fish he has gotten me into. For that, I am forever thankful! But the main thing I think of, when I think of Chris, is that after my first eye surgery, for the very first time in my entire life, he pointed out a school of salmon for me. There must have been 15! And I saw them with my own eyes, thanks to Chris! It was the first time in my entire life that I had witnessed anything like it! Before then, I had fished with a mind set that you couldn't ever see fish, you just blindly set your hook and line in the dark, murkey depths, waiting for what you didn't know was there. This not only opened up my mind, but has set me on a lifetime quest for more experiences such as on that very special day. I'm sure that he doesn't realize just how tremendous a gift he had given me. Fish on hook and line is not my ultimate goal. I want to see them swim in schools, or all alone. I want to witness a steelhead by flashlight, hovering behind a rock, deep in the darkest place of the river. I want to feel fish brushing up against my bare legs, and feel their tail flip against my foot as they dig a redd. I am standing barefoot in the moonlight, in the middle of a stream where salmon are spawning. The moonlight bright enough to see them, yet dim enough not to disturb their behavior. We are up! Click here for the ifish ISP! Get your account now, while the promotion is on! I am pickled tink about the new ifish ISP. It's kind of weird, after owning all of the ifish.net e mail addresses, that now I see other people with ifish.net addresses! It makes me feel like I've got a new family to share my home at ifish! TH rods is putting up a Holiday Special on ifish soon, so if you can't think of what to buy for that special fishing addict in your life, I've got an idea! You'll hear about it, soon! Last night, I woke several times to the sound of rain, but when I looked at the weather station, only .11 inches? I'll have to make sure nothing is blocking the rain gauge intake. That sounds too weird! Kilchis is in absolute heaven with the river on the rise. We spend more time on the river, and he's a riot to watch. He runs down the middle of the riffle with his mouth open, drinking in the river. Yesterday, as I stood casting flies, he raced from my side of the river, clear to the other, and beyond. I thought to myself, "Man, if I could move that fast, I'd sure cover a lot more water, fishing!" I envy his agility, and know that I'd catch many more fish if I had his energy and endurance. I was wearing hip boots, and that weights me down enough. They aren't felt, and the slippery rocks had me on my rear end more than once, yesterday. I don't know what it is, but my right leg keeps giving out on me, and down I go! To be splayed out on the rocks and have "Kilchis the youth" race past me laughing is humiliating! Oh, to have four legs, and the energy of a pup! Things are looking up! The rivers are rising, and my hopes match that rise. Big, beautiful fall salmon are on their way, and that very thought helps me to get up after each fall, brush myself off, and keep going! I found out yesterday that I have to be in the hospital on Monday for several tests. They'll put me to sleep. Tell me, please, that the rivers won't be prime that day. OK? However, one time I was released after surgery, I went out back, groggy and all, and caught a beautiful steelhead. Another surgery, a chinook. Maybe this is a developing pattern! Hey! I know what it is! Something about the smell of anesthesia attracts fish! Maybe I'm onto something! Whooo hooo, Pooh!! Dennis Stewart altered this pic of mine, and I thought it was noteworthy! Surprise! My Goldfinch, after more than a month gone, have come back. This really sent me for a spin, as they usually leave around late August, and aren't back until Spring. What are they doing back again? I had 15 at my feeders yesterday! Will they winter here? I also had a golden crown sparrow or two. The juncos have started to increase in numbers. It's birdy around here, already! Usually we have a very dead period, the first of Fall. Yesterday, Bill and I drove around, in the deep forest, hunting for mushrooms. There were several deer hunters out, and we gave a guy who had lost his way, a ride. The roads in the forest were very busy, and Bill and I dressed in our brightest orange to avoid a shot. Kind of scary out, with all the shooting going on. We did, however, find what we were looking for. Click here to see! I was so excited when we finally found chants that I really, at the time, thought it was more fun that fishing. I have since changed my mind, but it's a close second! We drove the roads, discussing the 99 floods and their effects on our return of four year olds this year. Have they been affected? Where are all the big Tillamook fish? Late? I hope! I'm kind of bummed that I have to be in the hospital tomorrow, but it will be over soon. I can't eat anything until tomorrow night. I can eat pop sickles, jello, and chicken broth. It's a far cry from last night's feast! Off I go. It's stormy and windy out. Last night I awoke to several episodes of thunder and lightning. I think it'll be a good day to watch movies, and just hang out. Maybe... just maybe, with .68 inches of rain, I'll sneak out to the river, and be surprised by a large fish on the end of my line. You think? I just put up an Ifish Hunting Trophy page. If you'd like to watch the progress, click here! I don't know a whole lot about hunting, but I'm learning! It will be fun to watch what the guys and gals drag out of the woods! Dang! I am so busy answering threads and posting things this morning, that I can't get my column written! It's wild on ifish! Lots of activity this morning on Tillamook Bay. I think the fish are coming in today! Whoo hoo! It's windy, and rainy, and nasty, but I just spoke to Pete, who has clients out on the bay, and he is doing well! Time to rig up and rev out! People are e mailing me like crazy of new elk pictures. Have to do that next. Wait a minute! I want to go fishing! ARGH! This is nutso! I have to go put up a picture that Elkoholic put up. ELK! E mails everywhere! This is one of those days where if you called me, you would want to hang up and leave me be. Please don't call! I can't keep up! Ifish hits have been skyrocketing, and just when I think things will level out, they go wild! New members by the dozens! Ifish used to be fairly regional, but Ifish is getting members now, spreading to Idaho, Montana, California! What is going on? You know, there is part of me that really misses the small, communal ifish that once was. That friendly feel, where we weren't afraid to say anything on our minds. Now, there are times that I type things three times, just to make sure I'm saying what I mean, and that it won't be taken wrong, by anyone. I was thinking about starting a new forum for old timers only. Like, you have to have a membership starting in 2002 or before? But that wouldn't work. People would feel left out. So, Ifish is just big. Period. However, when we do Christmas events, like last year, the core group is always there for lots of hugs. Kilchis is waiting, and so is Molly. I have to tell you about Molly... again. She never ceases to amaze me. I was sitting on a rock in the river, water rushing around me on all sides. I was probably two feet of rushing water away from the shore. Molly gives me a pitiful "Meow!" No, Molly... you can 't! YES SHE CAN! She jumped for me, slid off of my slippery waders, and into the rushing water. She made it to shore, and shook herself dry. She won't do that again! YES SHE WILL! And she did! She successfully made it to my lap, and most joyfully sat there and accompanied me while plunking. Molly is learning new tricks. She has figured out that if it is raining, and if I am wearing my knee length rain coat, she can stand on my boots, and use my coat as an umbrella. She stays dry that way, and can still fish with me. When it's sunny or dry out, she prefers to sit on my hat for a spectacular view. Being in the out of doors, with nothing but the rushing of water, the falling light, and otherwise total silence is wonderful. However, when out of the blue, you feel a wild animal crawling up your back, it can be quite unnerving. Never fear. It's just Molly! She has shaken me, a time or two. Wild cat??? Or Just Molly? It's only Molly. 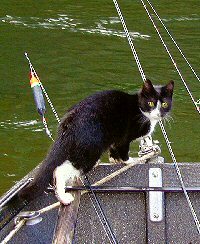 Molly the Kilchis River Fishing Cat. I gotta go. I've had enough internet today to last me a while. It's time to go fishing. Dontcha think? I was going to go mushroom picking early this morning, and return to a dentist appointment at 11:40, but... it's raining sideways, with 60 mph winds predicted for the Hedlunds... Oops! I mean Headlands! A fire in the stove and hot coffee just feel too good! The rain gauge, since 6:00 PM last night, shows .95 inches of rain, and I'll have to edit that, by the time I finish this writing. (Told you! Now it's 1.00!) It is just pouring! I want to be here, to watch the river's progress. It's a magical site to catch the first swarm of chinook coming up to fight their way over the rocks at the head of our property. It's worth standing in the pouring rain, to catch the first glimpse! My mind is full of prayer this morning for many people. Please hold Stan Fagerstrom in your prayers. He is having a heck of a time with his casting hand, and is in the hospital right now, for surgery. He wrote his column for ifish, before he left. You can access the article on Walleye fishing, by clicking here. Also, please take part in our ifish family letter to member, "Bluewater". You can read his story on our Angler's Chapel. Bluewater was hunting with his brother and daughter, when his brothers gun discharged and hit Joel in the upper leg. He was life flighted to the hospital, died in transport, then was revived at the hospital. We are writing Bluewater a group "Get Well" card on the ifish bulletin board, here. I also have a friend who is having a cancer scare. All these things flood my heart. It humbles me to complain about anything, when I hear of the situations others are presently in. Thank God for my aching legs! They move! They get me around! I may stumble, but I can walk, and my children aren't worried that I won't make it through the day! It's time for more coffee. Have a great day, and please let those that are less fortunate find a place in your heart and mind today. I can't believe this! Someone has stolen the Anti Snagging Shirts that we have had made! Fisherman's Marine Shirt Sale is cancelled at this point. This is just heartbreaking, AND infuriating! These shirts have no value, except to those that want to snag fish! Today is the day. Andrew and I are traveling to Portland for his echocardiogram, that lets us know how much, or if, his aortic root measurement is grown. Please remember to keep him in your prayers. Me, too, since I'm the almighty worried one! I don't know if KJ even worries about it. You know how kids are! I think he does, but if he does, he hides it well. It was really windy here last night, and continues to be so. Just had a gust of 39. It was so noisy that I had a nightmare that huge boulders were falling from the hillside, and my boys went out to watch. "Get in here!" I kept yelling at them, and they were dodging rocks, and being, well, they were being like boys! This rain has got to bring the fish in! I fished a bit with Bill yesterday, in between gusts. We didn't see a sign of them, but then, the river is murky, high, and full of leaves, yet. Got some bad news about the bulletin board yesterday. I had a special template created for ifish about two years ago. They are called JC templates. He designed the CSS that runs the board. Anyhow, the makers of the BB, Infopop, encouraged the use of these, and now have decided not to support them anymore. Wait a minute! These guys told me over the phone it was a good deal! Oh well. So, now I have to upgrade, and the templates are no longer supported. It's back to plain vanilla for ifish. I have to work to try and make the board look as similar to the JC templates that I can, without the CSS, so that I can upgrade the software. Lots of work! I may hire it out. I'm playing around with it myself, and if I'm not satisfied with my work, well... you know! I'm off now to wake the boys, and get going. Hope there are no trees down on the hi way! Andrew (Excuse me...Krazzy Joe) is checked out and ready for another 6 months! It was really weird, because his measurement was smaller! Now that is odd! The doctor couldn't explain it, and said it is not possible for it to shrink. There is some margin for error on these readings, so perhaps the last one was off? We just won't know until next time. But the fact is, he is alright and checked off until the next time! The rivers are prime. No time to be writing columns. The only thing to do now... is fish! By the way, though... Bill ordered and put up some Mason Bees last early spring, and am I ever glad he did! For the first time since we have lived here, our apple blossoms were pollenated, and we have apples! They are SO good! Thank God for Mason Bees! It is such an odd year! The salmon are late, and smaller. I fished the Kilchis yesterday. I witnessed one chum rising, and hooked and played one small salmon. It was the only fish we saw, or heard of, hooked. I lost it. Better to have hooked and lost, then to never have hooked at all, right? Boats were just passing us, shaking their heads. Where are the fish? Still in the ocean, feeding? Late? Or will it be a poor run in the Kilchis? It's mid October, and this is when the chum usually start showing in good numbers. Instead, they are trickling.. and I mean trickling(!) in, ever so slowly! It's not only the salmon run that is unusual. It is my birds and flowers, also! Yesterday, I had a hummingbird on my feeder! Two days ago, we had a bandtail pigeon! That pigeon should be long gone to Mexico! We have never had wintering hummingbird, bandtails, or goldfinch prior to this year, regardless if we left the feeders up, or not! Despite the strong (warm) winds we had, two days ago, my begonias were in full bloom, and healthy. Yesterday, I finally uprooted them, and stored their bulbs. I felt like a murderer! But, hey! It's almost November, you silly begonias! My fuchsia still hangs with beautiful blossoms. I can't quite nuke it yet! We had a month where it looked like Fall was coming. All of the spring birds left. Now, they are back! Goldfinch, purple finch, bandtails, and golden crowned sparrows! I can't help but question what they know about the winter to come. Is this El Nino? It seems odd, since all of our storms are again being pushed to the North, and we are sucking in California temperatures. It is so eerily warm and moist out, that if I did not have memory, nor calendar, I would think it is spring. The void of fish in the water, tells me it's true! It's springtime in October, everyone! Do you know I haven't had to turn on the heat once yet, this fall? Where are the crisp mornings, and the chilly nights? It makes me feel uneasy. We, as people, like routine, and this season is anything but routine! All I ask is that tomorrow brings a heavy run of salmon into the Kilchis. And I ask that, every single day! Perhaps if that one little miracle happened, I could feel at ease. After all, fighting a salmon, wearing shorts and a tank top in November can't be all bad! Last evening, I sogged through the field to take Kilchis, Dee Dee and Molly, our six month old kitten, down to the river. Molly thought she knew the way. She obviously didn't realize the river had come up, and landed twice, in knee deep puddles. What a cat! She simply shook herself dry, and scampered on! Remind me to get waders for her, OK? I couldn't help but bring along my bobber rod and eggs. The sun was setting, and turned the calm, full river into a soft, golden flow of molten liquid. Even the sound of my bobber slapping into the river, was muffled. It landed with a soft viscid, slap, and a thick circular wake rose slowly around it. Big, slow rolls of rapids carried the bobber into deep colors of yellow and golds, at the tail out. The river was like melting glass during a firing cycle. The flow like glass, when it becomes soft, then viscous and finally molten, all around me. Standing knee deep in the melting river, sweat beaded up on my brow, despite the fact that I had no coat on, nor was expending any energy, on this uncharacteristic, October evening. It's truly odd weather. It's truly an odd season. I want to wear sweaters, and coats, and scarves! Instead, I'm pulling out my summer tank tops, once again, and heading out to a river of melting glass, for salmon. .96 inches of rain, and still falling. And that is only since 6 last night! I can't wait to see the mighty Kilchis river! I think I'll fish today, but I'm not sure where. Certainly not out back! The river is just too high. Perhaps the bay is the only place I can go! Or-- A friend of mine has a new house right on a popular bank fishing spot. She has invited Bill and I over for a fishing party. I'm almost done with my work... The house needs to be cleaned, but hey... I'll have all winter to do that, right? I'm officially declaring this a fishing day. To heck with all else! I have NEVER seen such a thing! The sky is a deep, deep magenta! It forced me to go look at CNN, to see if something was wrong in the world! I had to go outside to stare at it. WEIRD! Now, it's getting darker! No! I didn't take any hallucinogenic drugs! This is just bizarro! Is it just the storm that's wasting Washington, or what? Just weird, weird, weather, I guess! Yesterday, I bobber fished at a friends house. She just obtained property on a popular slough, here in Tillamook. She is hereby now my best friend! However, I will have to invite her over to fish the Kilchis, too. It's a mutual best fishing friend thing! What is strange, though, is that I was wearing shorts and a tank top all day yesterday. It was so incredibly warm and humid all day. Just plain strange, for October 21st! This week is unbelievably busy for me. Doctors appointments like mad, and this weekend, I am supposed to get together with an old girlfriend down the coast, somewhere. It's a girls gab session. I've known her since I was 5, and we haven't done this, in ages. It will be good to catch up. Only prob: She doesn't fish! I can still bring my rods and reels and fish on the way, and the way back. It'll give me a chance to fish rivers that I haven't fished in ages. Yesterday, while getting ready to fish, I had the ultimate dilemma, that sent my wheels spinning. It's warm and humid out. The barometer is falling. The river is murky. What color of lipstick would the fish like best? I mean, hey... If I wear brighter lipstick, will they be attracted to it, or if I wear a pale matte, would I be less conspicuous? Which would attract the bite? You know, all kidding aside, I have joked about this for so long, that now, I actually almost believe that it matters as much as anything else. I mean, hey! I was fishing on the 12th avenue bridge in Seaside one Fall day, and no one was catching anything. I found a metallic ribbon on the bridge, tied it to my spinner, and said, "Hey, guys! Watch this!" I threw the spinner, began retrieving it, and guess what? 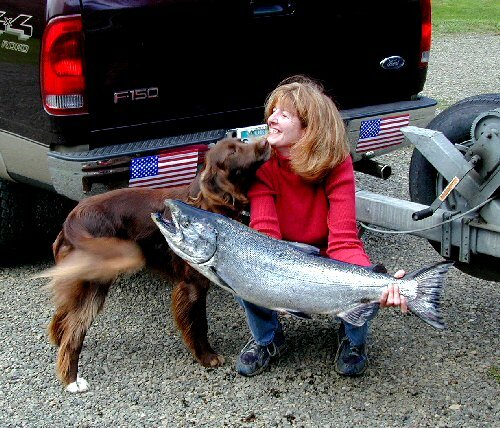 I reeled in a 30 pound chinook! The next day I went down to the bridge, and all the guys had metallic ribbons on their spinners. If that works, by golly, I'm going to pay close attention to my lipstick color, and you should too! Today, after fishing a bit, (like right now, I'm putting my waders over my pajamas!) I get to go to the docs and find out the results of a bazillion tests I had done a week or so ago. I'm anxious. I think I should put real clothes on, before I go. Shouldn't I? What color of pajamas are best for Chinook? It's really not only the shade of lipstick you wear, that increases your odds at landing a salmon. There are several factors. I'm a firm believer, now, in fishing in pajamas. Red pajamas, with white snowflakes, if you please. I believe that above all others, these pajamas draw the fish in, close to shore. A little Estee Lauder in "Pink Honey" helps, too. So, I'm standing there, in a back eddy on the bank of the Kilchis river. I'm feeling a bit handicapped, as I can't get to the other side of the river, where I'd like to be fishing. The grass is always greener, you know. The water, always more productive. The flow is high, but fairly clear. I can remember that last year, during low water, the chum were thick in this area, spawning. With little hope, and no where else to go, I set my bobber at 4 feet, figuring the depth in this area to be 6 feet, at the very highest. Perhaps there were some fish here, resting from fighting the otherwise strong current. I was adorned in red and white pajamas, as noted above. Over them, my breathable waders, and Korkers boots. The outdoor temperature was warm, so a light jacket covered my needs, topside. An appropriate portion of eggs, and a half live shrimp were my weapons of choice. A little squirt of Marie's Shrimp Scent increased my hope. I cast my bait to the wind. My dog, Kilchis, and my cat, Molly, joined me on the river bank. Molly, letting out a pitiful "meow" leapt onto my lower back, and tacked up the high wall, until she found a nesting spot on my shoulder. My fellow anglers across the river, (You know, in the greener grasses?) found this quite humorous. I can imagine! "Hey, there is a girl fishing in the rain across the river in her pajamas with a cat on her shoulder!" You see this all the time on the rivers of Tillamook. Right? Well, in some places! My bobber swirled in the current. In a way, it was kind of nice. No, I wasn't in normally productive fishing water, but hey, at least I didn't have to constantly cast, watch my bobber go downstream, reel it in, and cast again. Mine just circled in the current, backed up through the eddy, and did it again. I was on auto bobber. Realizing this, I set my rod down. OF COURSE, just as I did that, my bobber totally disappeared! I grabbed the rod, and with that movement, nearly threw my cat off balance, and into the water. Instead, she dug her claws in, deep. Hookset! We both gripped at the same time. I reeled in a nice, 20 pound, bright chinook. Molly cringed and adjusted her position, as I stepped into the water to unhook it. Keep it? I could have. It was a nice hen. Some feeling in me, yesterday, wasn't in the mood for ending it's life. Sometimes I feel like bonking. Other times, I don't. Partially, I think the reason for unhooking the salmon, and letting it swim off to spawn, matched my thankfulness for the cardiologist, who just this week, gave Andrew a decent bill of health with his heart defect, and sent him off, to live. Go fourth and spawn, almighty salmon! ...and likewise, go, Krazzy Joe, return to fight the currents of youth. It's never an easy road, but you are one of the lucky ones. The chrome hen gave a mighty swish of her tail, and disappeared back into the water, strong and sure. I have a good feeling that her destiny will be fulfilled. You have no idea how right and good that felt to me, despite the questioning and odd looks I got from the anglers on the other side of the river. "Why did you let that beautiful salmon go?!?" "Because everything is going to be alright." I thought to myself, as I smiled at them. I didn't say a word. I just gathered my things, and headed back to the house. Life seemed a series of perfect things. Perfect things like fishing in your pajamas with a cat on your back. Landing a salmon, and letting it go. Walking back to a warm house, with a happy and tired dog at my side, I noticed that the grass on our side of the river is pretty darn green. At least it is, for now. The river is dropping like mad, and I didn't even get to drift it! Went out last night, bobber fishing, and brought Bill in a nice, 12 pound buck. Funny how I got it. I cast way across the river, and got tangled in this limb that I know is there. However, just as the grass is always greener, the spot of water closest to danger and tangles, always holds more fish. Right? Right. So, I snagged up, and I tried to tickle it out. No luck. Darn. Break off yet another setup? Uh huh... I wrapped the line around the reel, pull, pull.... release! I got the setup! Then, why is it pulling back, again? Oh! By golly, it's a fish! I just love back yard fish! Well, it's approaching Halloween, and we all know what happens on Halloween, don't we? The chums, all dressed up with their frightening salmon costumes, parade up the coastal rivers. Nothing scares me more than having my rod bent over, and reeling in one of those salmon spooks! Trick, or treat? I'll let you decide. That's why I feed them rotten sardine filets, rather than snack sized Butterfingers. I've caught a cold, for the first time in ages. I feel rotten, achy and sore. I'm going to bundle up in my Exotherms, grab a blanket and a cup of echinacea tea... and head out to the river to get well. Every day Molly surprises me more and more. I just don't get it. I don't equate cats with fishing! But Molly... She likes every part of it! Here, she is inspecting the anchor system. Here are more pictures! She is certainly a doll, and she swims, too! I floated the Kilchis yesterday, and even with a cold, had a terrific time! I think that there are definitely medicinal properties to floating a river on a beautiful day. We should have stayed out back, though. The further downstream we got, the less fish we saw. I am fairly certain that all of the early fish shot upstream with the last rain. Immediately upon anchoring, while watching Molly dare to swim to the boat, my rod plunged down. It was right after saying to Bill, "Bill? We are about 4 feet out of the hot spot. Let's adjust the boat." He laughed as I struggled to get my rod out of the holder. "What's that you say?" A fine chinook salmon flipped the hook, 2 feet from the boat. Oh well! With a fish on that early, I was thinking the river would be red hot that day. Wrong! That was the only chinook we hooked. Later, downriver, I also landed a chum that was bright as a nickel. She was simply gorgeous, and hadn't put on her Halloween costume, yet. Next time I think we'll just stay anchored where we were when I hooked the fish. I think Molly thinks so, too. Today is Sunday, and I simply must go to church to repent of all my salmon sins. My shoulders ache, my whole body aches, in fact. I shouldn't do this anymore, right? That's what the doctors say, anyhow! When I first hooked the fish above, she hit with a full body slam. I was on free spool, at the time, letting out line, to find the bottom. I had to quick click it over, and give her the hookset of my life. This fish was a scrappy screamer, and after a show stopping double jump (that left other boaters jaws nearly scooping up bay water), it bore down deep and headed fast and strong for Memaloose. I was so impressed and excited with the double jump, that I was double and triple jumping in the boat, while playing it. I let out several wild war whoops. Bill thought I was going to abandon ship by accident. He grabbed onto the back of my jumpsuit to hold me in. I was so excited! "Bill! My heart! It's beating so hard! I can't do this!" And it was! It actually occurred to me that something could go wrong. Although my cardiologist warns against exerting this kind of energy, it usually doesn't even cross my mind. This time, it did. But, I couldn't stop! We had just pulled over to shore to play it. "Bill! Please! Go chase the fish! She's running fast!" As he did, I bent over with the rod to reel, reel, reel (!) the enormous slack in my line! Finally, I met with resistance, and was relieved to find the salmon, still fighting on the other end of my line. She wasn't ready to come in, really, but somehow, as I pulled on her, she was heading strong and swift for the boat. "Get the net!" The fish was soaring towards me, steady like, and I thought we'd take a chance. I didn't want to reel any more line in. I was afraid that the motion from reeling, or pumping, would deter the salmons perfectly steady soar towards the net. I lifted my rod high and continued leading the fish to the net. Bill reached out with the net, with all he had, and was able to scoop her out. The net barely captured the fish, while I stood there, arms high in the sky. They were stuck there. "Jen, you can put down your rod, now." "I can't. My arms are stuck." Success. I finally dropped the rod, and released the line. Bill turned to me. "Next time you hook a fish, try not to jump up and down. Save your energy!" Who, in their right mind, could watch a beautiful, chrome silver hen, nearing 30 pounds, leap out of the water and do a double jump, without a reactive jump (or ten or twenty), themselves? I was connected to it, for heaven's sake! It was like electricity passing through the line, and I was getting zapped, big time! Who could feel that steady, strong, jolt on their line, and not jump up and down, and do it again, a couple more times? Who could fight a fish like this, poker faced? It just couldn't happen. You know, the other day I had a salmon on the end of my line, while anchored, under a bridge. A truck passed overhead, while I was playing it. We were both standing, as the truck approached. "Sit down! Bill! We have no fish on!" I told him. "Sit down!" My selfishness got the best of me. I didn't want people to know I had a fish on, here. So, we sat down, and as my rod danced in my hands, I calmly sang, "Doo doo doo doo doooooo." The truck's driver glanced down at us. "Nothing goin' on, here!" As soon as I called "All clear!" I stood up, and finished playing the salmon. It turned out to be a chum, and we released it, with Bill's new Hook Extractor. You know, now I wonder if I had shared my excitement with the passing truck, if I'd have reeled in a chrome bright chinook. I doubt it, but you never know! I was able to put on a poker face, because I knew this salmon wasn't large. Yesterday's fish was grand! No way could I hide my excitement. No way, first off, because I was surrounded by 500 boats, but also because the show she put on, was unprecedented! Anyhow, I'm paying dearly for that fish. This morning, as Molly jumped on the bed, and came purring towards me, to wake me, I reactively reached out to pet her. My arms wouldn't move. I tried to turn over in bed. Nope. I was totally seized up! I'm up. I'm having coffee, and wondering... Do you think, even with these low water levels, that there might be a salmon out back? I better go put my waders on, and find out. I have three hours before church. Bill thought I was nuts to go out in the pouring down rain to fish today. I thought so too, until... well, until I hooked and played a couple salmon! What fun! I started out with four layers of clothing. Pretty soon, I was down to one, and still too warm! Rain, and all! Those fish really tire me out. Especially when I've been whooping and hollering, and chasing them through the whitewater! I'm really proud of the eggs that I cured. It's somehow gratifying to do the whole process yourself. Catch the fish, clean it, prepare the eggs, and then do it all over again! I want you to enter the contest I just put up for Tim Marshall. It's a great chance to fish with a great fisherman! To enter, click here! I've been working on the Christmas Party today, and I hope it's going to be as big, if not bigger than last year's event. It was awesome! Click here for last year's link, and here for the new link! See that bear I'm holding in last year's link? That's what I want for Christmas! That very bear! They could "bearly" get it away from me last year. It was a huge effort for me to give it up, and send it to the children's hospital. I don't know what it was, but the bear had soul, baby! And I wanted it! He was SO soft! Jennie sleeps with stuffed animals!!! It's true. Please don't tell anyone, but... I just do! Not all of the time, but occasionally! Somehow, when I am tired, when it is raining out, when all the kids are in bed, and my day is done, there is nothing better to me than a pair of flannel pajamas, a cup of tea and a teddy bear! OK, so now you know! Now... back to that bear! I really wonder sometimes who has that bear, now. Is it in the corner, somewhere, or is it really loved? Man, oh man, am I ever going to get made fun of for this one!!! Well, dinner is on. I'm tired, my shoulder aches from playing salmon, and it's raining out. 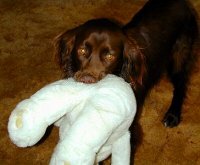 Kilchis is walking around dragging a big white fluffy stuffed bunny. Give me that, bunny, Kilchis! Stan Fagerstrom has a new column up, here! Please take a moment to learn how to prepare for a guided trip. Grant McOmie spot lighted the ifish anti snagging crew, last night on the 5 O'clock news. It was a great clip, and I'm so proud of the ifish crew's work! Click to see the feature, here. I'm glad to see new people interested in ifish. It takes a village to join all sports fishermen together to make a difference. Some people seem to get a little nervous when they see so many people sharing information about fishing. I have a solid vision of more people joining the NW Steelheaders, and Tillamook Anglers! More people writing letters regarding the Columbia River Spring Chinook Allocation Agreement, more people joining in with the Christmas Toy Drive, and more people wearing anti snagging tee shirts! What are we doing, here, at www.ifish.net? A whole lot of good!!! Want to join in on the fun and help make improvements to your fishing experiences? You can join the board, here, and get an ifish decal for your boat and truck, here! Not only is it fun to spot other ifishers on the river, you can display an ifish decal, and be proud to be a part of a group that is making an effort to make a big difference! ...and then there is the fact that you can learn when, where, and how to fish! I have been a total salmon bum lately! It's that time of year when everything happens at once, and my web work, and my house work gets put off! I get up every morning, and write out a list of what needs to be done, both on ifish, and at home. Then, I get in the boat, or walk out to the river, and leave it all behind! After three days of this, this week, I came home yesterday, and had the sudden urge to wear an apron, bake Snickerdoodle cookies, and be a real Mom for a while. I am almost praying for a flood. Something to stop this fishing insanity! Salmon! Stay away from my brain! Please don't call me with good reports! Maybe the water will stay too low and clear! Give me something to discourage me, and encourage me to get something done for a change! I spent the last three days sitting in a boat in tidewater, repeatedly casting my bobber for salmon. All three days long! Relentlessly! As if I had nothing in the world better to do! My kids are starving and nearly abandoned. The dinners I offer consist of macaroni and cheese, and a few slices of Wonder Bread. Or-hey, maybe a can of Ravioli? When the bus delivers my kids home from school, I'm often trying to catch up on e mail, or sound asleep on the couch. I'm sure my boys think that I've been working too hard, and that Marfan Syndrome is surely taking it's toll on me. Why else would their laundry be stacked to the ceiling in piles, or their dinner come from cans? "Poor Mommy!" Har, har, har... Poor Mommy out on the river! There are salmon in the bays, salmon in the rivers, salmon in tide water! Let's go get um! Chanterelles are just waiting to be harvested in the forest! Deer hunting and duck hunting are at a peak! Hey! Look at the ifish trophy page we are putting up! This is a web page dedicated to showing off their 2003 trophies! I love it! Now, if only I could stay home long enough to keep it caught up! The Ifish Community Boards expanded to hunting a couple years ago, and their community is a growing, great group of people! Check it out! Today is Halloween! Trick or Treat? I should choose treat, and simply stay home, make a decent dinner, clean the house, and catch up on ifish! "Kids? Off to school you go! I have tons of work to do! Bill? Load up the boat! Let's go!"